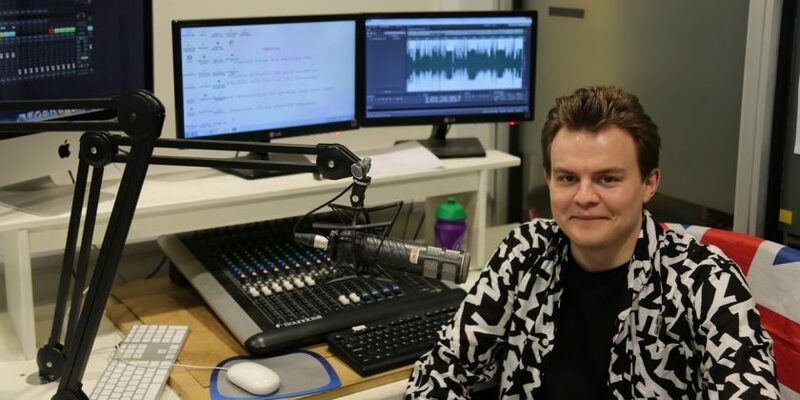 A dream job covering the Eurovision song contest has become a reality for a broadcasting graduate from Wrexham Glyndŵr University. Jamie Davies, from Malpas, will be reporting from the semi-finals of the contest in Lisbon next month. A keen Eurovision fan, Jamie had already booked a holiday to see the contest’s semi-finals which are being held in Lisbon, Portugal. In the meantime, he has been recording a series of hour-long radio shows on the contest which are broadcast on Calon FM, based in the University’s Creative Industries Building. However when the opportunity came up to cover the semi finals of the famous competition, it was something he couldn’t turn down. “I speak to a lot of Eurovision experts on my show, play some of the music involved, and generally have a good time,” said Jamie. Jamie, who is also a keen sports fan, will be reporting from the semi-finals in the contest – as, by the date of the final on May 12, he will be working as an event announcer for England Hockey. His memories of Eurovision are often linked with sport – he became a fan after he began watching the contest in 2011, the same day his beloved Manchester United won their 19th League title. From that initial spark, Jamie developed his interest in the contest, particularly its competitive aspects – but he still believes the key to winning is ultimately very simple. Jamie, who is currently working as a freelance journalist, credits his time on Wrexham Glyndŵr University’s Broadcasting, Journalism and Media Communications degree with helping to build his portfolio of work – and advises others considering applying to work with their lecturers to develop theirs. He said: “Use that opportunity to do as much as you can, get as much work experience as you can, build your portfolio and develop your CV – just like Eurovision, you have got to be the best. “Throughout the course, we really got to know our lecturers, and they really got to know us. You could really talk to them and they were all so supportive – any contacts they had in the industry, they would get them to come in and talk to us. Angela Ferguson, programme leader for the Broadcasting, Journalism and Media Communications programme, said: “It’s so good to see Jamie achieving his dream of covering the Eurovision song contest for the ESC Plus channel. “He has always worked hard and made the most of every opportunity for valuable work experience and opportunities that have come his way while at university and beyond.